They were Hollywood’s perfect couple. Two superstar actors and two wonderful human beings in the ideal romance. What could possibly go wrong? And could astrology give us some insight? Let’s first get an understanding of Angelina and what makes her tick. She is a witty, inquisitive Gemini as that is her Sun sign. The 7th house of relationships has Capricorn on the cusp which usually signifies she prefers relationships that involve serious guys who are either older or younger. Brad Pitt is 12 years older than her. The ruler of Capricorn, Saturn, is in Cancer but in her 12th house of undoing. She is a Cancer rising, a sign that says she is naturally shy but likes family and is nurturer. The Moon, which rules Cancer, is in the 9th house of foreign lands and is conjunct to Mars the ruler of her 5th house of children. They are both next to Jupiter which is the planet that tends to exaggerate or make larger….children + plenty + herself + foreign lands? It is no wonder why she’s adopting so many children and from foreign lands. Saturn the ruler of the 7th house (partners) is in a difficult square aspect to the Moon the ruler of the first house (her). So he can potentially drive her nuts and challenge her. Note: this doesn’t only apply to him but all her relationships, so it is a life lesson. Now let’s look at Brad’s chart. He is a Sagittarius Sun and Sagittarius rising. So he is very philosophical person looking to expand and very self-motivated. He can become full of himself and be very impulsive. He has Gemini on the cusp of his 7th house of partners and Angelina’s Sun is right on the cusp. A very strong position, so he is naturally drawn to her. Mars rules his 5th house of children and it is in his first house, so he is naturally comfortable with them. 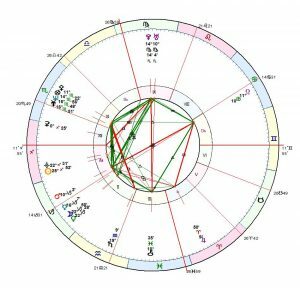 His chart calls out for many too because Jupiter (many) is in a square aspect from the 4th house of home. However, he isn’t as comfortable. Mars is on his south node which means he’s done this before in past lives if you believe in that stuff. Opposite of his north node it suggests they hold him back from relationships and moving forward in his life. He is actually a controlling and intense guy as Pluto (power/control) and Uranus (rebellion) are in a square or harsh aspect to his Ascendant (him) and to his Descendant (partners). They are in a positive trine aspect to Mars which means if the kids behave he is good otherwise they need to look out. The planets in the sky today reflect what is going on in our life today when we compare them to the birth chart. Let us examine what is going on with both of them based on the planetary positions today relative to the birth chart. Brad Pitt has a lot going on in his chart. Firstly in Transits, we see 4 major hits. The last eclipse and full Moon were in a harsh square aspect to his Ascendant (himself) and Descendant (spouse) axis. That eclipse also hits his Uranus which is close to his Pluto making this an explosive period where he needs to break free and to either have violent outbreaks and/or possible illicit affairs. This can also mean he will be forced to change himself. 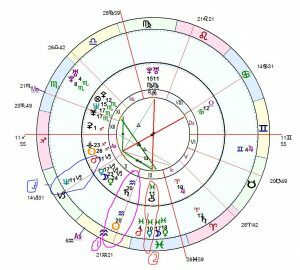 Transiting Saturn (difficulties, sobering up, and hard work) was right on his Ascendant and subsequently opposite his Descendant. So difficulties in the marriage. Transiting Neptune (illusions, delusions and washing things away) was doing the same thing as transiting Saturn because they are currently square to each other in the sky. This is very difficult for relationships. Transiting Uranus (surprises, rebellions) is squaring Venus, the natural ruler of relationships, so there could be an affair or the need to break from the current relationship. Both Neptune and Saturn are also playing on his Chiron which deals with him being a maverick but at the same time it is triggering some previous hurt he was dealing with. In a predictive technique called Solar Arcs he has 3 hits in the chart. Solar Arc Sun (his identity) is hitting his Saturn, his pla net of fears, self-discipline and hard work. So he is reconfiguring himself. Solar Arc Mercury ruler of his 7th of relationships (the descendant) is opposite Uranus bringing about a sudden change. Solar Arc Neptune is on his Mars. Neptune rules his 4th house of home, family and Mars rules his 5th of children. Neptune hitting Mars could make him really tired also and maybe he may be feeling emasculated at home. Neptune rules drugs and alcohol and Mars rules his 12th of undoing, so there could be substance abuse. So in conclusion Brad is going through quite a bit this month. He has a sense that he needs to break free from the relationship or restructure it. If you are conscious then you can navigate through this period albeit with difficulty. If you let your worst out, you’re blaming the marriage, looking for outside comfort. How about Angelina? 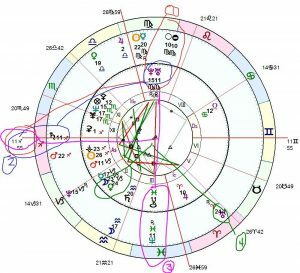 What does her chart say about all this? In transit, she has several hits related to her 5th house of children. Transiting Saturn has hit Neptune in the 5th house of children. Neptune in her chart has to do with lovers and children and challenging Saturn is making her think about her ideals around her children or lovers. 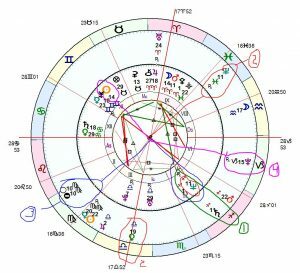 These events were happening while transiting Venus (relationships) was contacting her 4th house cusp of home and family. 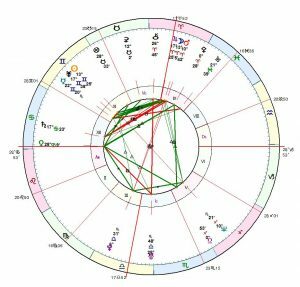 Her natal Neptune was also hit in a square aspect by the last full Moon and eclipse highlighting that there were going to be issues around this. She also has Pluto in an aspect called a quincunx which is a difficult period of uncomfortable pressure or tension, like not being able to spit or swallow. Pluto brings about changes and her Sun is being challenged. The Sun is her identity and who she is aspiring to be and it is being challenged by this powerful planet. Pluto is in her 6th house of illness, work and routine. She will be forced to make some changes or she can become very ill. She also has transiting Mars opposite Mercury –simply put arguments!! As you can see both people are dealing with various struggles of their own. It doesn’t necessarily have to signify an end of a marriage. By consulting an astrologer you can figure out where you are both at and realise when the difficult periods and issues will end. You can gain an understanding of what you are going through and how to deal with it. Or then again you can just split up and call it quits.